Lieutenant Patrick Wright ANDERSON , 8th ( Service) Bn The Black Watch, 10th ( Service) Bn The Black Watch , & 18 Sqn RFC & RAF who was the eldest son of the late Patrick Wright Anderson, accounant , of 43 Hill Street, Arbroath . Prior to the outbreak of the Great War he was a Maths /Science student at the University College ,Dundee and a Corporal in the St Andrews Uni O TC . He was commissioned 2nd Lieutenant into the 8th (Service )Bn Black Watch along with 2nd Lieutenant William Stewart Robertson from Broughty Ferry & St Andrews University . Both were appointed Lieutenants in the 10th ( Service) Bn The Black Watch . Lieut Anderson was appointed Bombing Instructor of the 26th Div in France and for a short time in Salonika prior to returning to operational duties with his Battalion . Lt W S Robertson MC 10 Black Watch att 4/5 Black Watch was killed in action in France on 9 Sept 1916 . Lieutenant P W Anderson was an Observer in DH4 with 18 Sqn RAF on 27 June 1918 and he was seriously wounded to the stomach and thigh over Flanders . He spent months in military hospitals in England ( Eaton Sqn London, & Swanage) and discharged home to Arbroath . Arrived Arbroath Railway station by Ambulance Train on Armistice Day 1919 and he died of his serious wounds in the Arbroath Infirmary on 2 November 1921 . 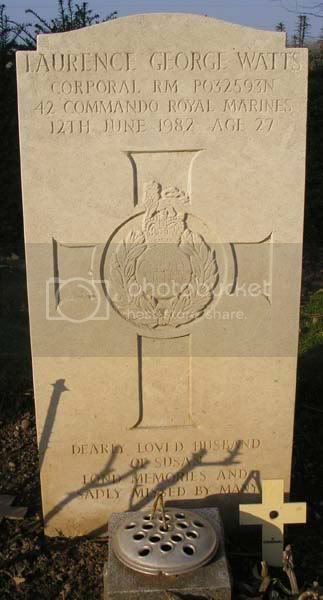 He is not classed as a Casualty of the War by the CWGC as he died after their cut off date of 31 August 1921 . 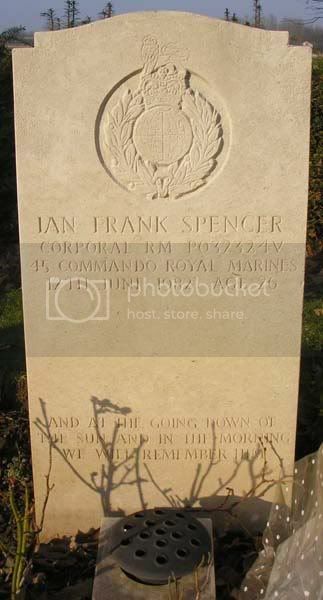 Although Marines Laurence Watts and Ian Spencer both died on the same day in June 1982 in the Falkland Islands they have different headstones. I wonder why that is? Is it because they served in different units?